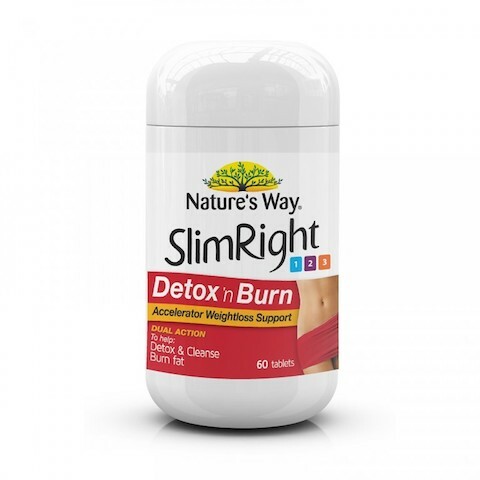 SlimRight Detox 'n Burn trigger thermogenesis for fat burning, and supports your body's natural detoxification process. Use Detox 'n Burn in conjunction with a healthy, calorie controlled diet/weight loss program, like the SlimRight 1,2,3 Weight Loss Program. This is a new advanced approach to help your weight loss efforts. This breakthrough dual action formula combines two very important processes to help you. It targets both the detoxification process to help cleanse the body of toxin build up, bloating and water retention for a flatter-looking stomach and to help you feel lighter, while helping to support your metabolism burn more fat. Why Choose Detox 'n Burn? This is a new advanced approach to help your weight loss efforts. This breakthrough dual action formula combines two very important processes to help you. It targets both the detoxification process to help cleanse the body of toxin build up, bloating and water retention for a flatter-looking stomach and to help you feel lighter, while helping to support your metabolsim to burn more fat. Who uses Detox 'n Burn? Those who are looking for increased support of their weight loss and detoxification goals. Directions: Adults - take 2 tablets with water 3 times daily, 30 minutes before meals or exercise. The maximum daily dosage is 6 tablets.